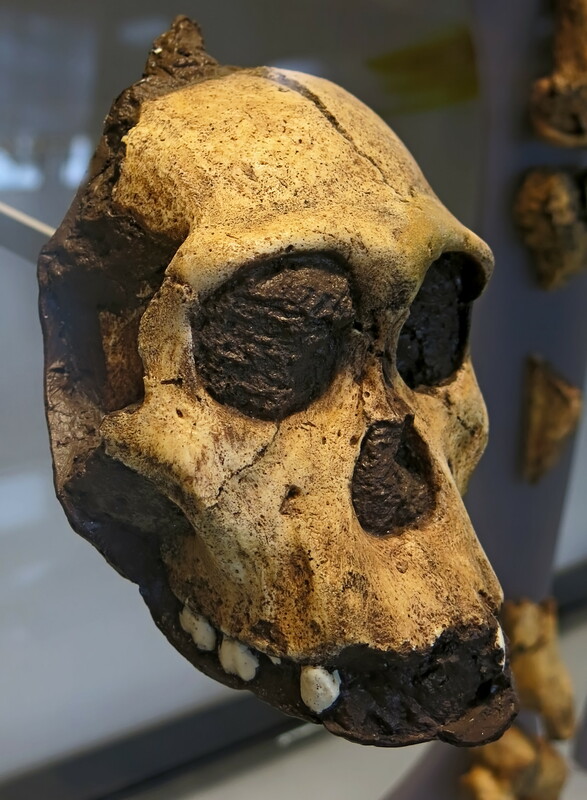 Also found at the Malapa archeological site were a variety of animal fossils, including sabre-toothed cats, mongooses, and antelopes. Berger and geologist Paul Dirks speculated that the animals might have fallen into a deep 100 - 150 foot (30 - 46 m) 'death-trap', perhaps lured by the scent of water. The bodies may have then been swept into a pool of water with a sandy bottom rich with lime, allowing the remains to become fossilised. Cranium of the Malapa hominid 1 (MH1) from South Africa, named 'Karabo'. 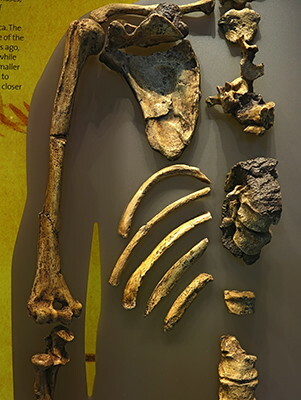 The combined fossil remains of this juvenile male is designated as the holotype for Australopithecus sediba. Matthew Berger moments after his discovery of the clavicle of Australopithecus sediba at the Malapa site, Cradle of Humankind, South Africa. The fossil was dated using a combination of palaeomagnetism and uranium-lead (U-Pb) dating which showed that the fossils are no older than circa 2 000 000 BP. 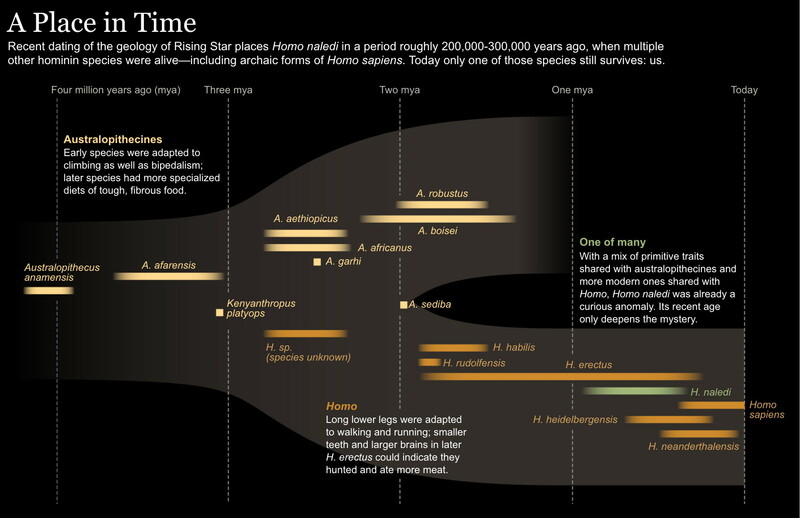 The presence of animal species which became extinct at 1 500 000 BP. indicates the deposit is no younger than 1.5 Ma. The sediments have a 'normal' magnetic polarity and the only major period between 2.0 and 1.5 Ma when this occurred is the Olduvai sub-Chron between 1.95 and 1.78 Ma. Accordingly, the fossils were originally dated to circa 1 950 000 BP. Recent dating of a capping flowstone demonstrated this was not possible and the normal magnetic polarity sediments have since been correlated to the 3000-year-long Pre-Olduvai event at 1 977 000 BP. 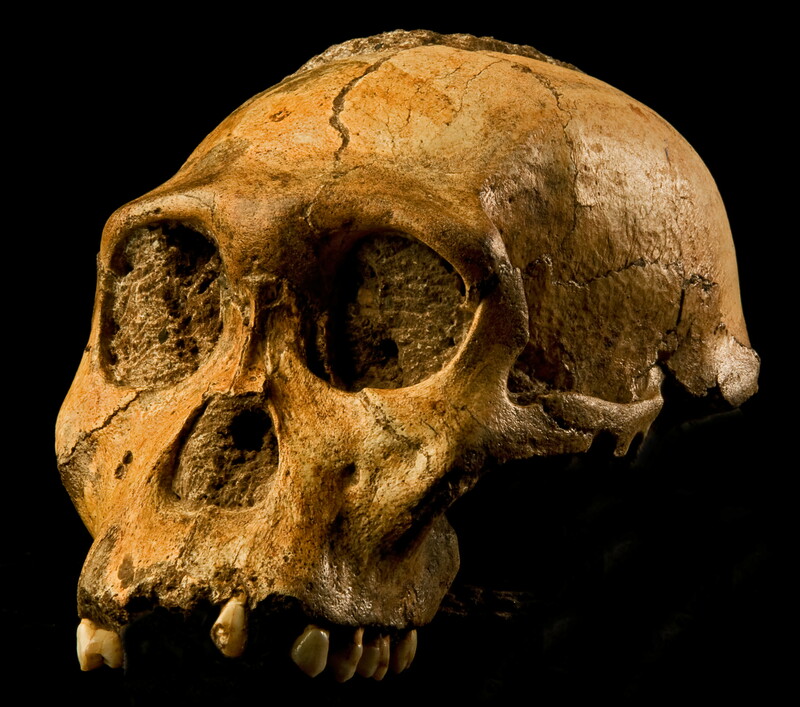 Morphology and interpretations Because of the wide range of mosaic features exhibited in both cranial and post-cranial morphology, the authors suggest that A. sediba may be a transitional species between the southern African A. africanus (the Taung Child, Mrs. Ples) and either Homo habilis or even the later H. erectus (Turkana boy, Java man, Peking man). 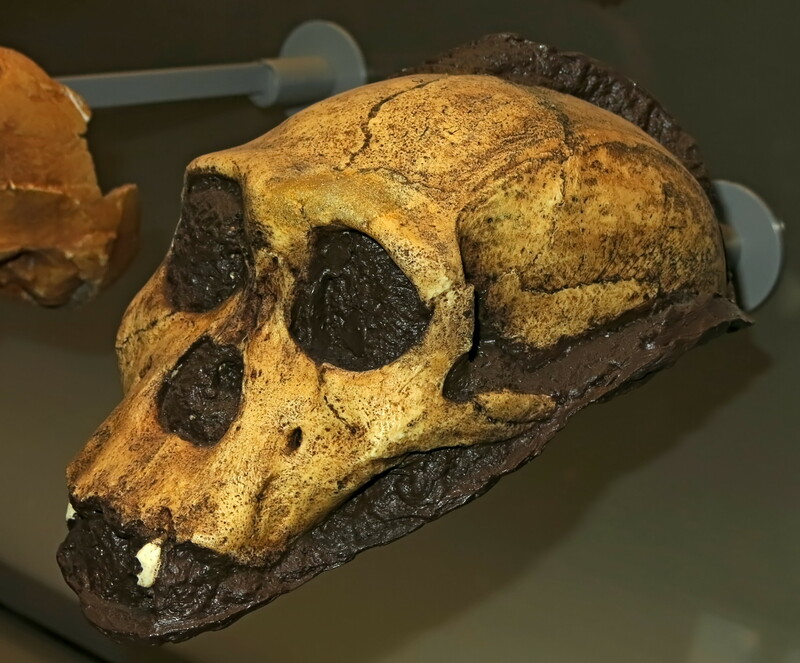 A reconstruction of the skull of Australopithecus sediba holotype MH1, or Karabo. 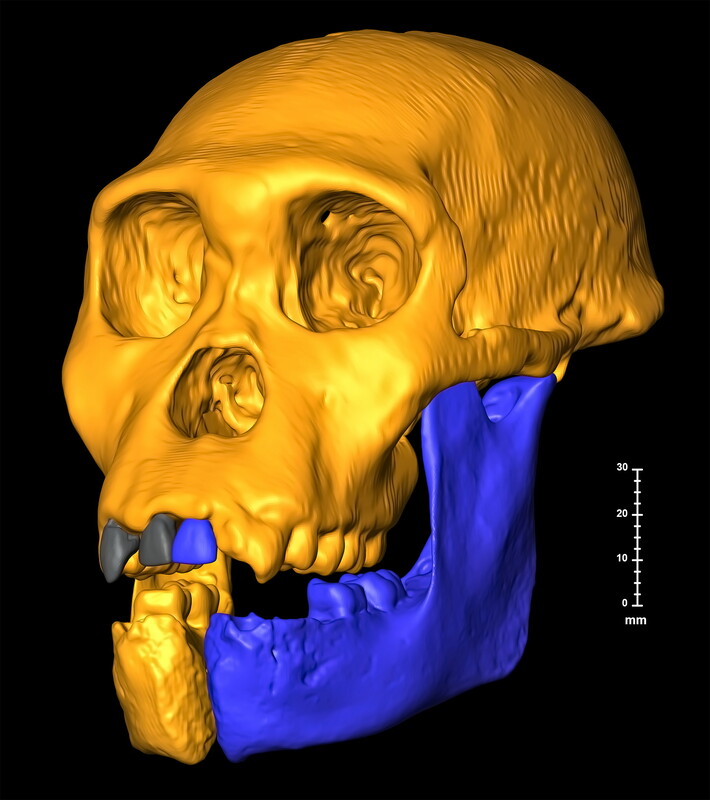 The cranial capacity of MH1, which has been estimated to be at 95% of adult capacity (420 cm3), is at the higher end of the range for Australopithecus sediba and far from the lower range of early Homo (631 cm3), but the mandible and tooth size are quite gracile and similar to what one would expect to find in H. erectus; so similar are these features that, if found in isolation without other skeletal remains, they could be classified as Homo based on tooth and mandible size. However, the cusp spacing is more like Australopithecus. 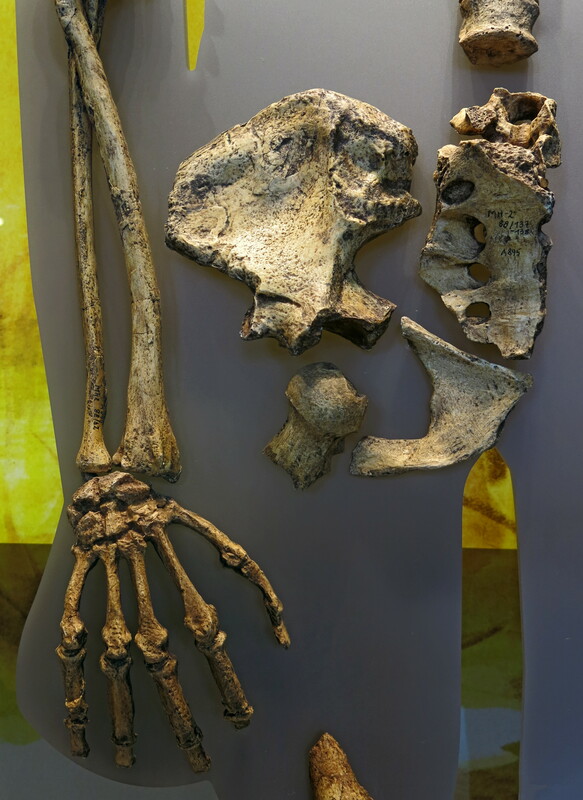 Australopithecus sediba compared to its ancestor species Australopithecus africanus on the whole is described by Berger et al. as more derived towards Homo than Australopithecus garhi, especially showing a number of synapomorphies taken to anticipate the reorganisation of the pelvis in Homo erectus, associated with 'more energetically efficient walking and running'. The femur and tibia are fragmentary, but the foot combines an advanced anklebone combined with a primitive heel. 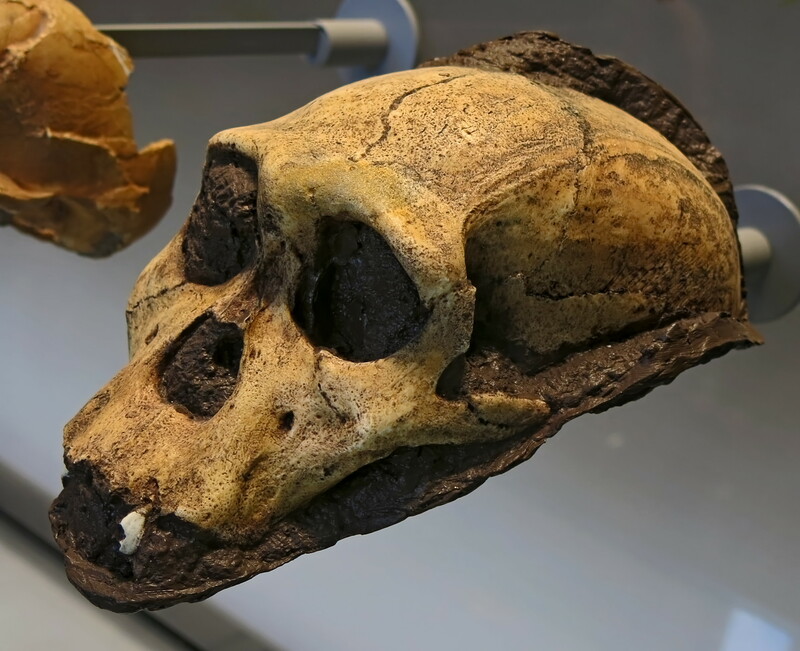 Its cranial capacity is estimated at around 420–450 cm3 (26–27 cu in), about one-third that of modern humans. 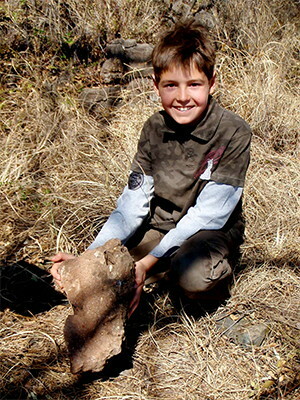 Reconstruction: Kristian Carlson, courtesey of Lee R. Berger and the University of the Witwatersrand. 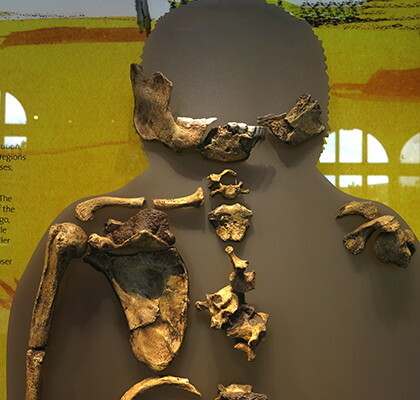 Australopithecus sediba, type specimen, MH1. Partial cranium, circa 2 - 1.8 million years BP. The phenomenon of mosaic evolution, that is the development of different regions of the body at different time phases, is illustrated by this skeleton of Australopithecus sediba from the Malapa Cave in South Africa. This surprisingly late representative of the genus, at some 1 900 000 BP features the typical brain size, while other characteristics such as smaller teeth, longer legs and changes to the pelvis are thought to put it closer to the genus Homo. A well-preserved and articulated ankle of Australopithecus sediba is mostly humanlike in form and function and possesses some evidence for a humanlike arch and Achilles tendon. However, Australopithecus sediba is apelike in possessing a more gracile calcaneal body and a more robust medial malleolus than expected. 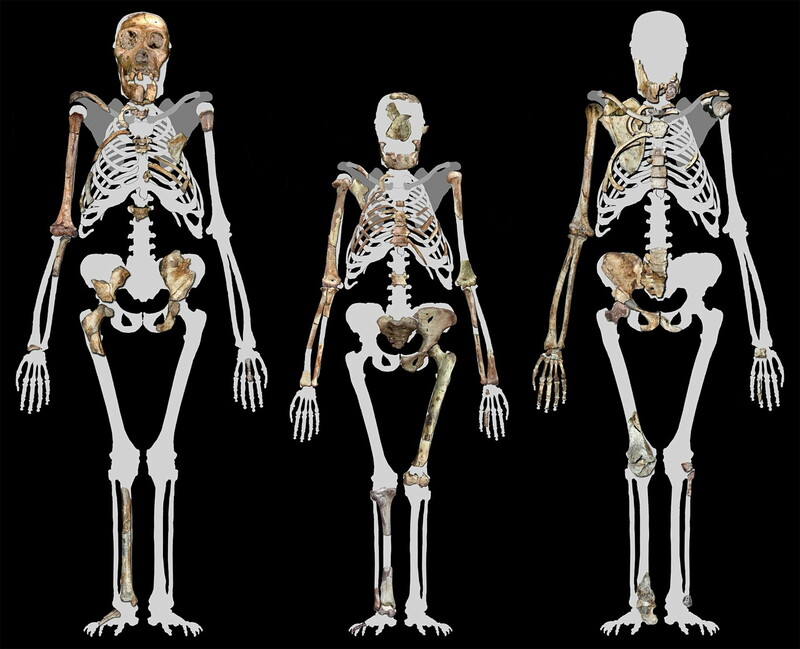 This shows that Australopithecus sediba may have practiced a unique combination of bipedalism and arboreality. 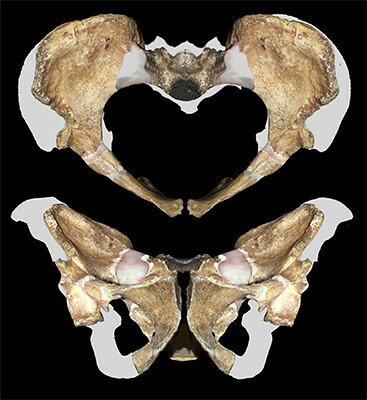 The reconstructed pelvis of MH2. Left side is a mirror image. Photo: compiled by Peter Schmid courtesy of Lee R. Berger, University of the Witwatersrand. 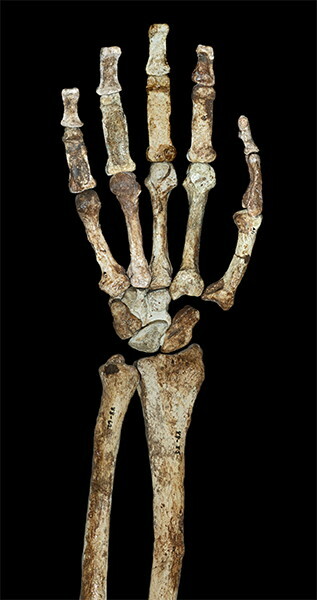 The hand and forearm of Australopithecus sediba (MH2). 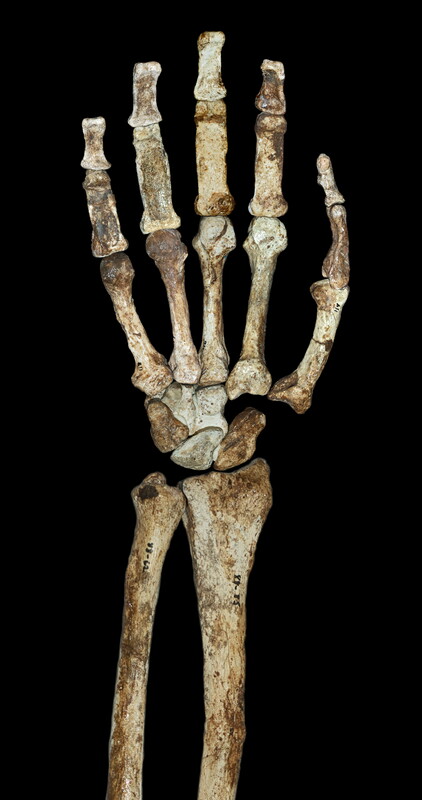 Australopithecus sediba had a surprisingly modern hand, whose precision grip suggests it might have been another tool-making Australopithecus. Evidence of the precision gripping and stone tool production can be seen from Homo-like features such as having a long thumb and short fingers. This nearly complete wrist and hand of an adult female from Malapa, South Africa presents Australopithecus-like features, such as a strong flexor apparatus associated with arboreal locomotion. Photo: Image created by Peter Schmid, courtesy Lee R. Berger and the University of the Witwatersrand. 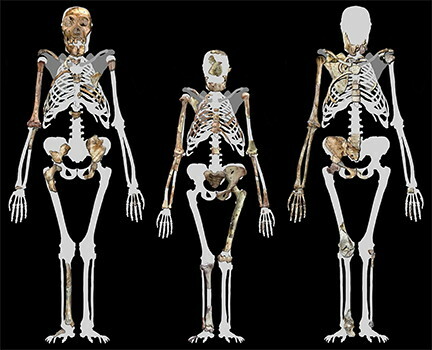 Malapa Hominin 1 (MH1) left, Lucy (AL 288-1 (Centre), and Malapa Hominin 2 (MH2) right.